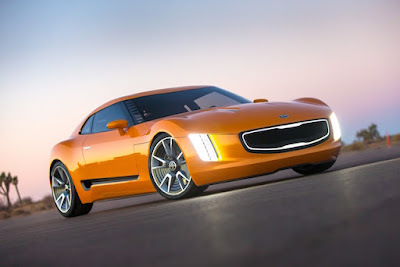 The dream of a two-seat #Kia sports car to rival the Mazda MX-5 is not dead, just resting – that's according to the firm's chief design officer Peter Schreyer. 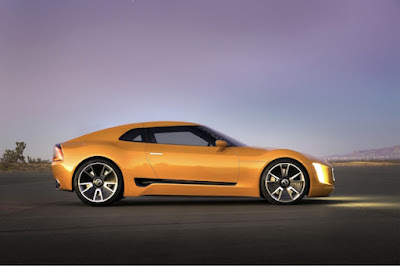 The GT4 Stinger Concept, showcased at the Detroit Motor Show back in 2014, could be resurrected in a similar guise and on the roads as soon as 2021. Ever since the striking concept, with its svelte curves and bold orange paintwork, broke cover in the States three years ago, there's been little news as to whether it'll ever make it into production. However, now Kia's design chief has broken the silence and revealed it's still very much on his to-do list and, what's more, could be here in as little as four years. 'The GT4 Stinger Concept dream is certainly not dead,' he explained. 'It's not going to be here in the next four years... but then you never know. Schreyer's comments are the strongest hint yet from one of Kia's most senior bosses that the dream of making a Mazda MX-5 rivalling sports car is still in the minds of the Korean firm's top brass. Kia's UK team believe a small sports car could certainly work here too – but the ultimate test will be how successful the four-door Stinger sedan is when it arrives later this year. A spokesman for Kia UK said: 'We know we have sporty variants of smaller cars to come, but they are versions of existing cars, so to go down the two-seat coupe or open top market is another significant step – but it's one we look at all the time. The Kia spokesman said the firm is now working on preparing the market so the public is ready to accept a two-seat sports car from the manufacturer if and when it arrives. 'Peter (Schreyer) has always wanted to do a proper sports car but the brand, certainly from 2004 to 2015, just wasn't ready for it,' explained the spokesman. 'Peter personally has a strong feel for that kind of car, though. 'From our perspective, the last 10 years of Kia in the UK has been about building credibility, building a strong market base and building an acceptance of Kia as more than just a value option in the mainstream. 'If Stinger works as it should, then it will open up another part of the market so it has acceptance of Kia as an alternative.